Word of mouth influence is one of the most powerful and organic ways to build buzz around your event or cause. According to Nielsen, 43% of consumers are more likely to make a new purchase when learning about a product or service via social referral. Blogs have become an essential part of the new media system of word-of-mouth. With significant following and one or more digital platforms, the right blogger can help amplify your message and spread the news about you and your events. Read through our tips below for how to establish lasting community connections with bloggers. Bloggers often have clear niche interests. This often makes it easier to invite them to your event than other traditional media outlets. As you research, think about bloggers that are relevant and influential in your area. If you are hosting a cooking class at a restaurant, think outside of the box and look for individuals who blog about food from varying perspectives. Find mommy blogs about food preparation, food-to-farm organizations, and of course foodies. Every industry has subcategories and target markets. Pay attention to the blogs that have already written about your competitors; it’s more likely that they will be interested in writing to you, too. Tip: Blog Catalog and Google Blog Search are a few free resources for searching for interest-specific blogs. Sometimes, something as simple as a fully-loaded gift bag is enough to warrant a dedicated blog post. Even better, the goodies included in the bags can also work as giveaways or contest prizes for their readers. You can also offer unique discount codes to your future events or shows for the readers of the blog. Bloggers work as virtual conduits for your message. The potential for your event to go viral relies heavily on nurturing their readership. Don’t forget to include a link (not an attachment) to photos and videos associated with your event or with the industry the blogger writes about, that would be appropriate to include along with a blog on your event. Bloggers need visuals to keep their readers’ interest! Making your event information easily shareable is key to any media outreach. Bloggers are no different. Organize all of the necessary information for your event including: date, time, location, event images, flyers, parking information, etc. If a blogger doesn’t have to spend hours researching your event, they’ll be more likely to feature you in their editorial schedule. Tip: Crafting Facebook, Twitter and Instagram-ready posts can help extend your messaging on varying social platforms. If you’ve created an event-specific hashtag, you can also start building buzz around your event weeks before it begins. As you begin your outreach, be genuine in your efforts. If you see them posting an article about your show beforehand, comment, share and like it. Retweet their tweets and start following their work in advance so they’ll have some context for who you are before your invitation. Don’t forget to thank them both publicly and privately for their coverage and treat them like VIP at your event. You never know what a great relationship with a blogger can do for you in the future. These beginner tips should get your started with your outreach efforts. If you have any questions or comments about inviting bloggers to your events, email us at Promo@BrownPaperTickets.com or call (800) 838-3006 (Option 5). Tags: blogging, Event Success, Social Media. Comedy Outliers: Blog About It! 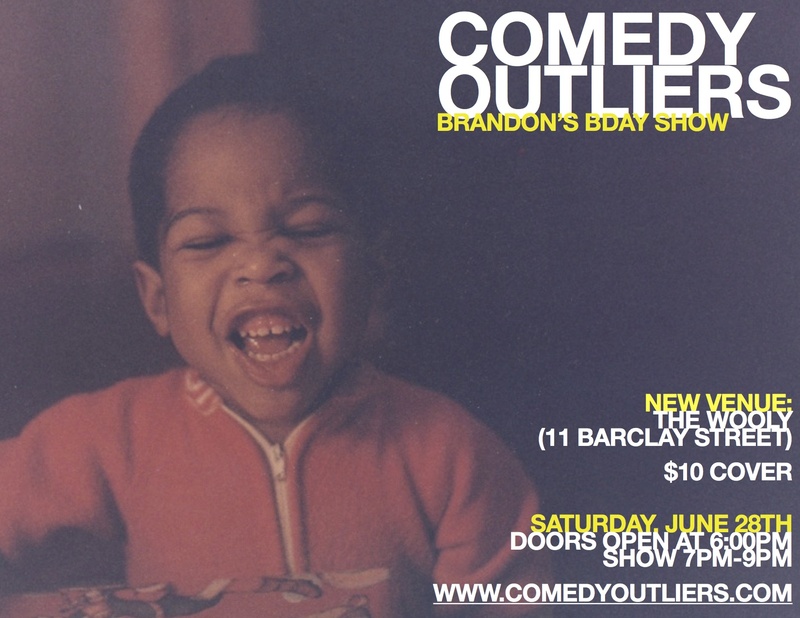 Tod ay we feature another guest post from Brandon Collins and Mike Brown of Comedy Outliers. Brandon and Mike offer great advice to comedians, or performers in general, on how to survive and thrive in today’s competitive artistic climate. 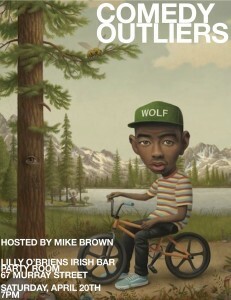 The Comedy Outliers have a show coming up this Saturday, April 20 at Lily O’Brien‘s in New York City. Their shows are free but we highly recommend you pick up tickets so you don’t show up to a full house. It’s sad that as performers, we have to do things that are not performance-related to have people come to our show. In 2013, having talent and a diligent work ethic isn’t enough. Sure we can host and produce the pants off of Comedy Outliers and get listed through various publication’s help, but if we don’t have any representation in the digital realm…we don’t exist. In some cases, the digital medium doesn’t really lend itself to our cause. 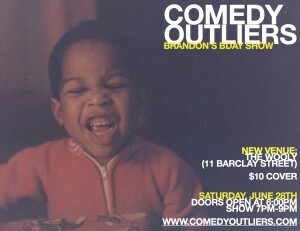 Let’s say you like the Comedy Outliers show, then you make sure to like the fan page. Sounds great (and THANK YOU) until Facebook monetizes our hard work. They suggest/force/penalize us into paying money so we can reach you, who’ve already agreed to being reached in the first place! All the work put into to creating our fan base is done just so we can pay Facebook to reach our fans? Something doesn’t smell right. We need to grow out of the manure. If we want Comedy Outliers to grow as a show, we need continue to build a great show- not a stronger web presence. It amazes us how potential audience members might dismiss our line-ups because a comedian may not have a website. We’ve heard “Has [insert comedian here] been on TV? Where would I know them from?” In turn, we will say “take my word for it” but they want to take the comedians words, in 140-characters or less, before they make a decision. Some people would rather we have Outliers on Twitter instead of business cards. Ah, the power of the internet. YOU (the reader) have the power in your hands. Don’t judge a show (or performer) by their web traffic. Judge them by their talent, and support them with your…well, support! Come out to a live show (like ours next Saturday, April 20th) or make a purchase of some merchandise so we performers can focus on performing. Tags: blogging, Brandon Collins, Comedy Outliers, Lily O'Brien's, Mike Brown.